Jamaica... Nine days on this breathtakingly beautiful island already lie behind me, every minute filled with impressions, sights, smells and sounds that wait to be processed and stored in memory. Stimulus satiation, niceness overdose! And it doesn't stop. Tonight we enter the lush garden of Hotel Pegasus, a huge complex in the middle of the capital's business quarter New Kingston. Illuminated by colourful lights, the place has been equipped with a big screen and a speaker's stage, and arriving guests are welcomed with a free drink of juice or soda. The atmosphere is light and festive, people from every corner of the world greet each other in this little kaleidoscope of the Reggae world. 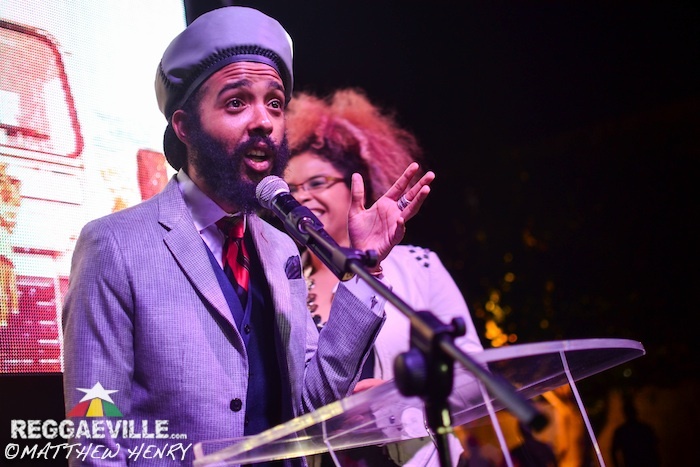 Around 600 of them came to join the event that made us assemble here: the album-launch of Protoje's Ancient Future. 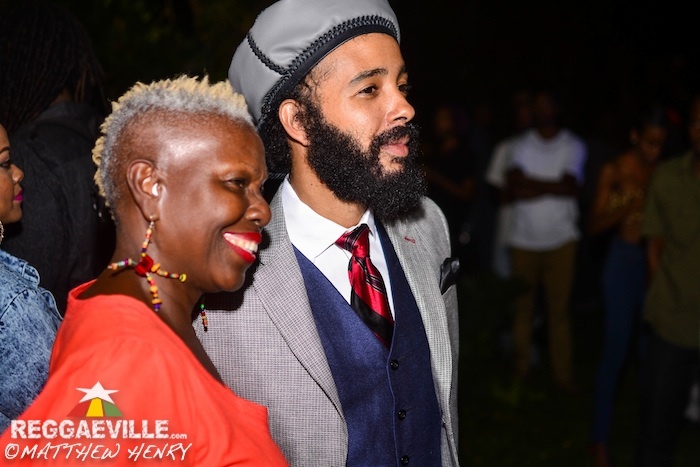 After an official welcome by Tricia "ZJ Sparks" Spence, who leads through the entire evening, we get to see a little documentary that captures backstage and onstage scenes as well as fan's comments and images of the daily grind of the Protoje tour last year. The subsequent "Making Of" shows us intimate moments of the conception of Ancient Future: studio-sessions and interview-snippets grant a very much appreciated view behind the curtains of musical history in the making. On the closing quote ("Essentially, this album is a letter to myself. "), Sparks comes up once more to present THE MAN himself: Protoje! Dressed up finely for the occasion, he appears in a white button-down shirt, red and black striped tie, a navy blue vest, khaki-coloured jacket, matching pants and - of course - his charatceristic tam hat. He is smiling like a child on its birthday, obviously excited, although nothing ever seems to throw him off his calm and confident poise. The first thing he does after welcoming everybody is surprising us: even though supposedly on tour with Damian Marley, sound magician Phillip "Winta" James (Overstand Entertainment) enters the stage. The man responsible for the distinctive sound of the album is cheered as much as the artist himself and expresses his joy of working on the project. At 9:15, the songs of the album itself are presented, one by one. Starting with the beautiful Protection, Protoje tells us little background stories on each of them, like how the lyrics have been conceived or how he came into contact with the featured artists. Two of them, Mortimer and Sevana, are immediatly introduced to the crowd, adding a face to their powerful voices. Asked what this evening means to him, Mortimer later reveals that "it feels like a start, like the beginning of something new.". Right on! As we reach Stylin', another surprise is due: Candy, the main actress of the accompanying video, is here! According to Protoje, she was the only one he saw fit for the shoot, because "she has just that attitude, you know!". It is really really nice to hear each and everyone involved mentioned, from the film crew to the background singers. Respect to whom it is due! While Sudden Flight, Bubblin' and Answer To Your Name nice up the mood, press representatives take advantage of the breaks to speak to and take pictures of the singer-poet. In between the songs he makes us aware that his mother and even his grandmother, a lady in her nineties who came all the way from St. Elizabeth, are in the place, as well as important Reggae dignitaries such as Prof. Carolyn Cooper, Riddim Magazine editors Pete Lilly & Ellen Köhlings and more fellow artists and musicians than I could name here. Excitement peaks when a movement in the crowd indicates the arrival of yet more illustrious guests: Kabaka Pyramid, Chronixx and their following have arrived! Just in time for the final song The Flame, Protoje brings them all on stage and each in turn holds a little speech. They then enjoy their success together, skanking along to the beat, exchanging smiles and posing for the cameras. The final round of applause is followed by an announcement of the meet & greet at the promotion-stand. Already on his way there, the star of the night is crowded with fans, photographers and journalists, and during the next hour he is gallantly signing CDs, posters or (in my case) the article about him in the current Riddim magazine. 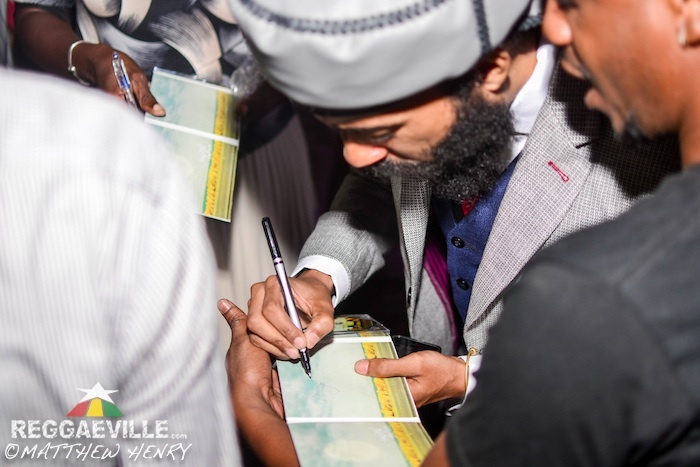 I take the chance to ask what it means to him to have the album launch right here in Kingston and he states: "It's important to start it here. It's always good to dance a yaad before you dance abroad, seen." These words are accompanied by a smile that expresses a little exhaustion but most of all an exuberant pride and joy of having come that far. The place is closed down just before midnight, and Protoje and the In.Digg.Nation crew are off to new adventures, release parties, a tour. It definitely doesn't stop here. The Ancient Future is unfolding in front of these gifted artists, and everyone is invited to join in and take a part of this conscious trip together. "And so me stay: substance over hype!"